If you read our earlier post on choosing the right covering for your outdoor room, you already have an idea of some of the different choices you have. Depending on what you’re considering for your home, there are other options available for covering that outdoor living room, kitchen, or other backyard space. A gazebo is an example of a free standing shade that can be used. These types of structures can be open or more enclosed. Some even have screens. They can be made of wood or other materials and have removable coverings on them. If there is enough room in your yard and you’d like something permanent, a gazebo may be what you’re looking for. 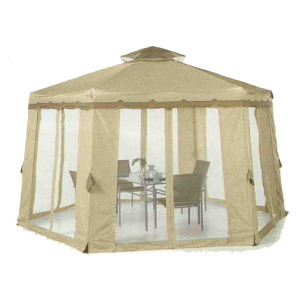 But if you’d like something movable, there are also portable gazebos that can be easily set up. These can be erected on a patio or deck, and you can even take them with you to the beach or park. This is a common shade solution for an outdoor room. It is a permanent structure that’s more like a roof. It can be installed over your deck or patio to keep out rain and sun. It is ideal to use for a fixed area like an outdoor kitchen or outdoor fireplace room. A shade sail is used when there are pillars, trees or other items that the awning part can rest or be tied too. Using these specific items, you’re able to create a beautiful, unique look to your backyard with minimal work. There are many styles of shade sails to choose from. While a nice looking awning to have, the retractable awning is also one of the most expensive that is out there. It can come out when you need it, and then rolled back in when you do not. While this can keep it intact and looking the best against the weather elements, it is also quite costly to have it put in. The manual retractable ones are less expensive than the motorized ones. Don’t forget to consider a beautiful pergola for your backyard space. They can really make a difference and stand out. Shade sails and other types of coverings can be combined with a pergola for more shade. Here at ALD, we are able to provide you with the pergolas, outdoor kitchens, or whatever else you’re in need of for your ideal backyard space. We specialize in custom design that reflects the visions of the homewner, and we’re sure we can find something that really speaks to you. Plan now so you’re ready to go when the weather warms up. Give us a call today for a free initial design consultation. We offer landscape design and installation in the greater Minneapolis and St. Paul metro area as well as surrounding communities, including western Wisconsin.